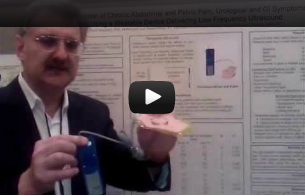 #1 "Reduction of chronic abdominal and pelvic pain, urological and GI symptoms using a wearable device delivering low frequency ultrasound"
Click here or on thumbnail for clinical data. Click here for a video summary of the clinical data. David Wiseman, BSc, PhD, MRPharmS and Teena Petree, PT. 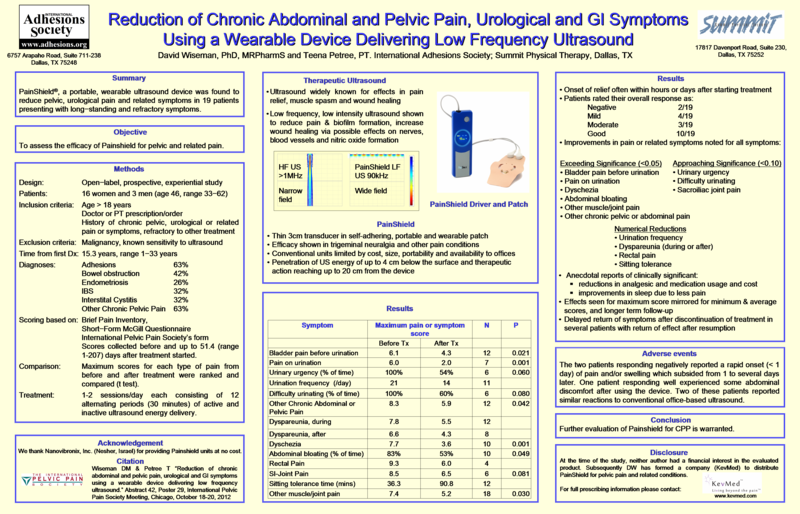 Objective: To assess the efficacy of Painshield (NanoVibronix Ltd., Nesher, Israel) a wearable device delivering low−frequency, low intensity ultrasound in patients with pelvic and related pain. Methods: In this open−label, prospective, experiential study, 16 women and 3 men (age 46, range 33−62) with a history of chronic pelvic, urological or related pain or symptoms (15.3 years, range 1−33 years), received Painshield on prescription. Diagnoses included endometriosis (26%), adhesions (63%), bowel obstruction (42%), IBS (32%), Interstital Cystitis (32%) or other CPP (63%). Patients provided information about their symptoms before treatment and up to 51.4 days (range 1−207) afterwards. Scoring was based on the Brief Pain Inventory, Short−Form McGill Questionnaire, and the International Pelvic Pain Society’s form. Scores from before and after treatment were compared by t test comparison of rankings of levels (0−10) of each type of pain using the maximum score reported. Results: Often exceeding or approaching statistical significance, improvements in pain or related symptoms were noted (before treatment score v. after treatment score, N, p) for all symptoms which were pain before urination (6.1 v. 4.3, N=12, p=0.021); pain on urination (6.0 v. 2.0, N=7, p=0.001); urinary urgency (% of time) (100% v. 54%, N=6, p=0.06); urination frequency/day (21 v. 14, N=11); difficulty urinating (% of time) (100% vs 60%, N=8, p=0.08); Other chronic pelvic or abdominal pain (8.3 vs 5.9, N=12, p=0.042); dyspareunia (during) (7.8 v. 5.5, N=12); dyspareunia (after) (6.6 v. 4.3, N=8); dyschezia (7.7 v. 3.6; N=10, p=0.001); abdominal bloating (% of time) (83% vs 53%, N=10, p=0.049); rectal pain (9.3 v. 6.0, N=4); sacroiliac joint pain (8.5 v. 6.5, N=6, p=0.081); sitting tolerance (minutes) (36 v. 91 mins, N=12); other muscle/joint pain (7.4 v. 5.2, N=18, p=0.03). Patients often reported the onset of relief within hours or days after starting treatment and a reduced need for analgesic or other medication. Overall patients rated their response as Negative (2/19), Mild (4/19), Moderate (3/19) or Good (10/19). The two patients responding negatively reported a rapid onset (< 1 day) of pain and/or swelling which subsided from 1 to several days later. One patient responding well experienced some abdominal discomfort after using the device. Two of these patients reported similar reactions to conventional office−based ultrasound. Conclusion: Further evaluation of the utility of PainShield in this patient population is warranted. Summary: PainShield, a portable, wearable ultrasound device was found to reduce pelvic, urological pain and related symptoms in 19 patients presenting with long−standing and refractory symptoms. We thank Nanovibronix for providing PainShield units at no cost. At the time of the study, neither author had a financial interest. Since concluding the study, the primary author's company has become a distributor for PainShield.